Certain combinations are meant to be together. Peanut Butter and Jelly. Bacon and Eggs. Timon and Pumba. Ross and Rachel. The #1 combination that I will never tire of is Tomato Soup and Grilled Cheese. It’s a match made in heaven. A match so perfect no other can surpass it. Growing up, my Papa used to make me tomato soup for lunch out of the can. He always made it best using milk instead of water. It was one of my favorite lunches and we always paired it with either a simple turkey sandwich or grilled cheese. No one made it like him and whenever someone tried, it was never as good. Maybe that was just me being a brat but it made a difference. This recipe is inspired by those cold days when we had tomato soup for lunch. I think we can all agree that homemade soup is much better for you than canned. For starters, the sodium content alone decreases. You are in control of the ingredients and you know what’s going into the pot. With a medium-sized saucepan and an immersion blender (a regular blender or food processor also work), you can whip up your own version of Creamy Tomato Soup easily and in no time at all. It’s a few basic ingredients, most of which you’ll find in the pantry. To play off of the canned soup with milk classic I grew up on, I wanted this recipe to also be creamy. Tomato soup is great in any form but I love how comforting a touch of milk, or in this case, heavy cream can be. Start by sauteing the garlic and onion. Not only do you want them to soften, you want them to release the sting so that it brings out the natural sweetness. A little black pepper and basil season the dish but if you’d like a little kick, add some red pepper flakes. It’s a nice metabolism boost. San Marzano Tomatoes are ideal because they naturally have a little more sweetness to them. Any canned tomato would work in any size though. The tomatoes and veggie stock come to a boil and simmer for a few minutes to release the bitterness from the tomato. Once that’s ready to go, blend and then add in the heavy cream for a final touch. You won’t be sorry! Let’s talk about the Grilled Three Cheese for a minute. This is no ordinary grilled cheese. 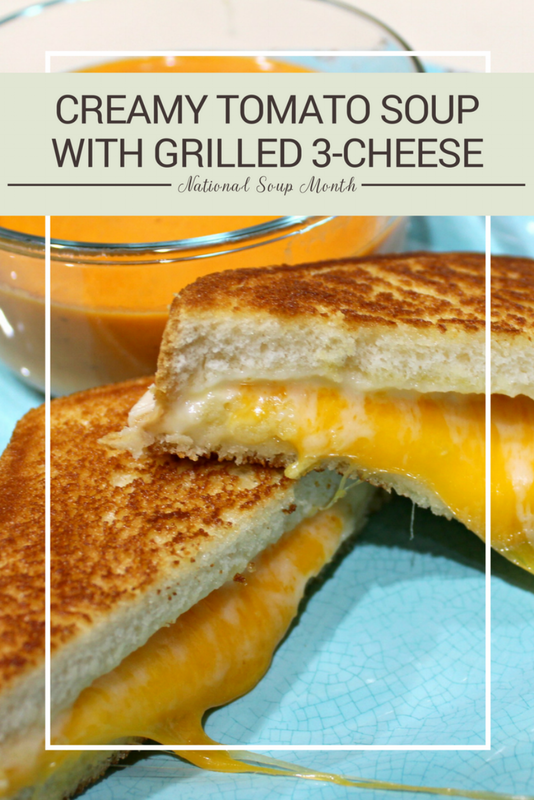 It uses a combination of Cheddar, Havarti and Gouda for a balanced flavor combination and...it’s baked. Searing the sandwich on a griddle toasts each side of bread nicely. It doesn’t get the cheese all gooey though and the bread is still too soft. Finish the sandwiches on a baking sheet in a preheated oven for a few quick minutes. The cheese gets so gooey, it might as well be liquid, and the bread finishes toasting for a great crunch without burning. Slice it in half, see the cheese pull and get ready to dip. This is a sandwich you’ll be coming back to night after night. 1 - In a medium-large soup pot, heat the olive oil over medium-high heat. Add the onion and cook until softened. Add the garlic and saute a minute or two until fragrant. Add the black pepper, basil, and red pepper (if using) and give a quick stir. 2 - Add the tomatoes and veggie stock to the pot. Break up the tomatoes with a wooden spoon. 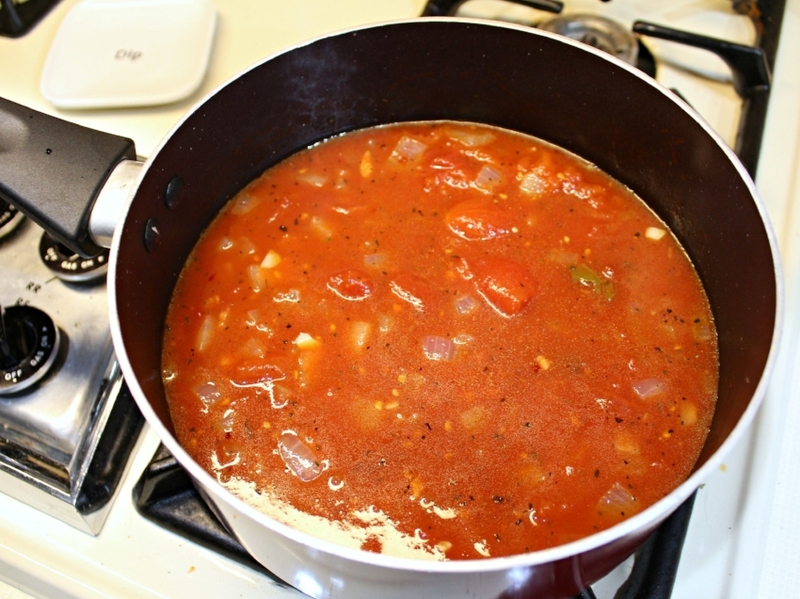 Bring to a boil and simmer 20-30 minutes until some of the liquid has evaporated and the tomatoes have sweetened. Turn off the heat and let cool. 3 - Using an immersion blender, blend the tomato mixture. If you don’t have an immersion blender, carefully transfer the soup to a blender or food processor and blend. You can blend the soup until it’s smooth or leave some chunks in there for texture. 4 - Turn the heat back on to medium-low. Add the heavy cream and stir in. Let simmer another 5-10 minutes and serve. 1 - Preheat the oven to 350 degrees. Heat a skillet over medium-high heat. Butter one side of each slice of bread. 2 - Build and grill the sandwiches. Place one side of bread butter-side down on the griddle. Add a slice of Gouda, Cheddar and Havarti cheese and top with the final slice of bread, butter-side up. 3 - Let cook 8-10 minutes* per side until the bread has browned and lightly toasted. Press down with the spatula before flipping. Flip carefully not to ruin the sandwich. Remove to a baking sheet. 4 - Once all of the sandwiches have been grilled, place the baking sheet in the oven. Bake 5-8 minutes until the cheese has fully melted. Serve with the creamy tomato soup. * NOTE: The first side may cook faster than the second due to the pan getting hotter over time.